Emotions are like the weather. Which meteorological conditions occur most often in your inner world? Are there any that you are really afraid of? How do you respond when you feel out of control? And if another person is out of control, how do you react? 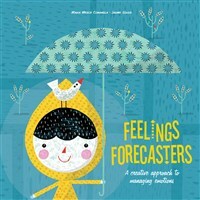 In this revolutionary approach to emotional education, we learn that our emotions affect our inner and outer climate. They can improve or poison it, affecting our ecosystem and that of our family, school, and friends. Through stories and activities, children learn how to make a beautiful umbrella to protect them from all kinds of "rain," along with strategies for preventing emotional "pollution" and avoiding "tsunamis" and "acid rain." The activities, which include a guide for mentors and teachers, help children become sustainable and creative people, increasing the quality of their personal relationships and the world in which they live.